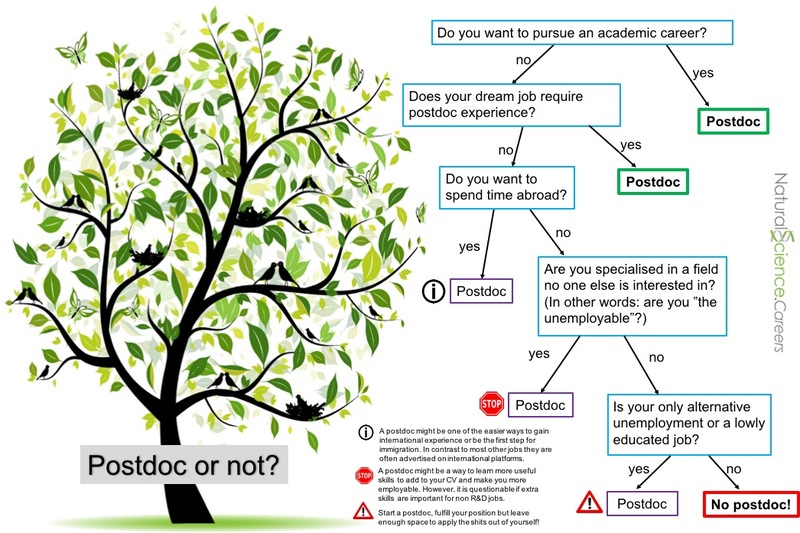 Shall I do a postdoc or not? That is a very important question that you have to ask yourself before starting to apply for jobs. We believe that in most cases it is relatively easy to answer this question. You should just ask yourself what you would like to do in the future. Would you like to proceed as a researcher in academia and could you imagine running your own research group in the future? In other words, do you want to have a career in science? – Do a postdoc! Or, does your future career plan or dream job require you to have postdoctoral experience? 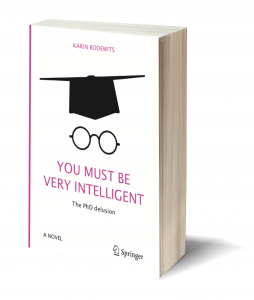 If a clear yes, you should certainly do a postdoc. However in the latter case, we would advise you to contact one or more people who are active in your “dream career” if this is really a set requirement or if there are other ways to get there. Typically this is only the case in top jobs, e.g. as research team leader in a big pharmaceutical company. In some cases, experience outside of academia would be judged as more valuable than postdoctoral experience in academia. A postdoc can also be useful if you feel that you want to change/expand your field of expertise, be it that you see no career opportunities in the field you currently work in or that you´re just sick of it. In the latter case this is usually not a problem outside of academia as you will typically not use your core specialisation to the fullest extent anyway. Another good reason to do a postdoc could be to go abroad for a few years or settle in a new country. In this case it might be a good “easy entry” or “parking position” to go abroad and to learn a new language and get to know a new culture. Also, due to many young and internationally minded people in academia, it might be the easiest way to find new social contacts and establish a network at the new location. Unfortunately, there are also many scientists that are signing up for a postdoctoral research time for the “wrong” reasons and slip into long postdoc phases without actively choosing for it. Two of the reasons you hear very often are that they struggle to find a job outside of academia or that they went the easy way, and took the postdoc place they got offered after their PhD. If you are sure that you want to leave academia and do not want to have a career in science, we would strongly recommend you not to do a postdoc. The general “rule” is that the longer you stick to the university, the more specialised, experienced, and older you get. Already the “normal” qualification level of Master plus PhD keeps you in university for typically 8-11 years. Consequently, you might become less and less attractive to employ for a company. Many companies prefer to employ people that have a broader background, a more flexible mind and can therefore still be “shaped” by the company. Hence, it might become much more difficult to find a job outside of academia with a longer postdoc phase. Of course, you could use a postdoc as a “parking position” to apply for other jobs. Clearly, the challenge is to keep enough time free for these applications while still fulfilling your responsibilities as postdoc. The advantage in this case is not only that you are not pressed for time and are in a comfortable situation, but also that it is easier to negotiate while having a position. When being unemployed it is quite hard to ask for a high salary unless you know that there are alternatives lining up for you. If (financially) possible, we would recommend you to keep your nerves and take the time to apply for jobs until you find the job you really want to do! Are you afraid to leave academia because there might not be a way back? Such a path is definitely challenging, especially if you have been out for longer. However, intersectoral mobility is increasing as academia and industry are moving closer together and collaborate more closely than ever. The topic of diversity is high on the list for many universities, which gives an extra incentive to give “unusual” candidates, including those who left academia for a while, extra chances for (re-) entry. The challenge of this step is to still come up with a clear research vision, despite the fact that you didn´t work in academic research for a while.